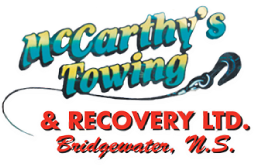 For quick and reliable towing, lockout services, and repairs, call McCarthy’s Towing & Recovery Ltd. We specialize in damage free towing for vehicles of all shapes and sizes covering all of makes and models. Based in Hebbville, we serve a wide area from Shelburne to Hubbards and everywhere in-between. Call McCarthy’s Towing & Recovery Ltd. today for roadside assistance. We are available 24 hours a day, 7 days a week. Our response time is usually within 30 to 45 minutes depending on your location and overall we respond to our phone calls within 30 minutes.